The teaching of grammar in Danish secondary schools seems to be moving back towards a rather traditional view on grammar (for example, an A-level examination in English testing whether students can correct wrong sentences and explain the rules of grammar). I was hoping that an article by you may offer a new perspective on the teaching of grammar and authentic language. Her steely gaze subdues the general clamour. Their forms, a few examples, and their senses. We’ll finish, as is usual with a test. He always takes the bus (she writes). ‘The present. (Though present, as we speak, it clearly isn’t). We call this timeless present “present simple”. Between the rows of startled little faces. ‘I’m walking to the door. Now I am turning. She demonstrates the present tense (continuous). ‘Now, who is this?’ She shows a pic of Caesar. ‘An ancient Roman?’ someone says, to please her. She draws a Roman galley, oars and mast. ‘He came, he saw, he conquered: simple past’. She illustrates what means the past continuous. ‘I’ve been to China. In my life. Just once. Time not important. Use the perfect tense. We also use the perfect with progressive. ‘The future forms we’ll save until … the future. I think by now you have the general picture. The English language grammar lesson goes. The English language learner can’t converse. 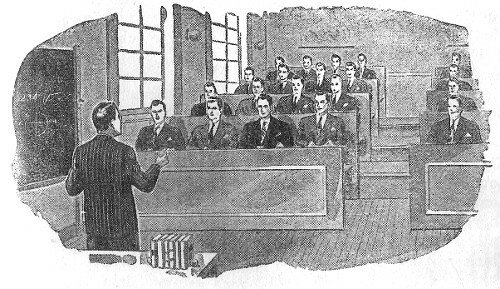 Illustrations from Jan, J.M. 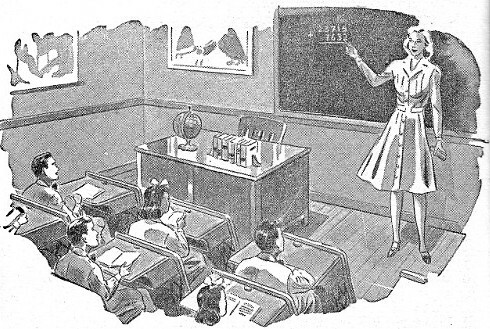 & Ollúa, R. (1950) El Inglés Práctico; Comercio, Exámenes y Viajes, Buenos Aires: Academias Pitman. In this second short video on the English tense and aspect system, I take a look at perfect aspect. Following on from the discussion on backshift, in which I argued that the past tense had less to do with time and more to do with distance, I want to now turn my attention to aspect – or, at least, to the progressive aspect, initially. Libyan leader Muammar Gaddafi has told the BBC he was loved by all his people and refused to acknowledge there had been any protests in Tripoli. 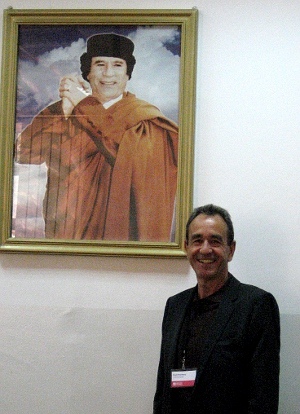 Col Gaddafi said that his people would die to protect him. Libyan leader Col Muammar Gaddafi has told the BBC he is loved by all his people and has denied there have been any protests in Tripoli. In fact, it was the “he was loved” that first attracted my attention, because of its (deliberate?) ambiguity. He was loved, but no longer? When I went to print the story out, I noticed that the text had been (deliberately?) disambiguated: He is loved. So, I was thinking how many different patterns (or grammatical structures), there are in English where one has to move back? In indirect speech we do not usually repeat the speaker’s exact words. Reporting usually takes place in the past, so the reporting verb is often in the past. As a result, the tenses of the reporting clause are usually ‘moved back’. This ‘moving back’ of tenses is called backshift. A useful general rule is ‘present becomes past and past becomes past perfect'” (Alexander, 1988, p.290). So he says, my people love me. They will die to protect me. He said that his people love him. And that they will die to protect him. 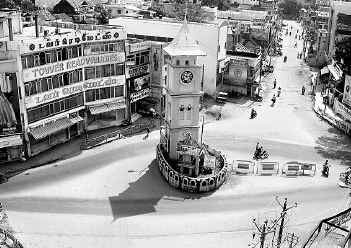 Tower Junction, Nagercoil: the deictic centre? I have been here in this hotel now for a week. He said he’d been in that hotel then for a week. But what if the person doing the reporting is not only in the same hotel, but reporting the speaker’s utterance more or less at the time that it is uttered? He said he’s been in this hotel now for a week. In other words, reporting has to obey – not the grammar book rules – but the rules that the context imposes. Even Alexander (1988) acknowledges the fact that “a speaker can choose to report a statement or a question using the tenses that match his viewpoint, based on the facts of the situation as he sees them at the time of speaking” (p.293). That is to say, if there is distance, mark it. If not, don’t. Which, after all, is why we use the past tense to talk about the past, not so much because the past tense flags pastness, but because it flags distance. His people love him (now). His people loved him (then). He wishes his people still loved him. If only his people loved him now. I’m sorry, what was your name? I was wondering if you have this in a smaller size? All of which suggests that we might be better off following the example of a number of linguists (e.g. Lewis, 1986;Yule 1998, ) by referring to the –ed form, not as the past tense, but as the remote form. “Teaching speech reporting should not be over-obsessed with backshift and sequence of tenses with indirect speech at the expense of the rich variety of tense and aspect forms that real data throw up” (McCarthy 1998, p.172). Alexander, L. (1988) Longman English Grammar. London: Longman. Lewis, M. (1986) The English Verb. Hove: Language Teaching Publications. McCarthy, M. (1998). Spoken Language and Applied Linguistics. Cambridge: Cambridge University Press. Yule, G. (1998). Explaining English Grammar. Oxford: Oxford University Press.